Container Dumpers | Phenix Equipment Inc.
Flexicon’s dust-free TIP-TITE® Container Dumpers and Open-Chute Container Dumpers accommodate popular sizes of drums, boxes and other containers used for storage and shipment of bulk solid materials. All are offered in mild steel with durable industrial finishes, with stainless material contact surfaces, or in all-stainless models finished to food, dairy, pharmaceutical or industrial standards. 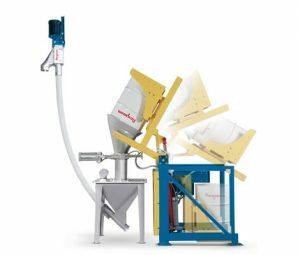 In addition, all are available with Flexicon mechanical or pneumatic conveyors, rotary airlock valves or with flanged outlets to feed any process. Stop Dust: TIP-TITE® Dumpers hydraulically raise and rotate the container, creating a dust-tight seal against a discharge hood that mates with a gasketted inlet port fitted to any receiving vessel. Pneumatic or manual slide gates control flow. Improve Safety: Ergonomic concerns of manual methods can be eliminated with controlled, automated TIP-TITE®Dumpers, which incorporate features of stringent global safety standards. Increase Reliability: Flexicon engineers and builds TIP-TITE® Dumpers specifically for fail-safe reliability under constant use in demanding environments — and backs them 100% with a performance guarantee. Cut Cost: The smooth, safe, dust-free and reliable operation of TIP-TITE®Dumpers improves the efficiency of a repetitive task, with significant savings in labor and downtime, maximizing your payback.